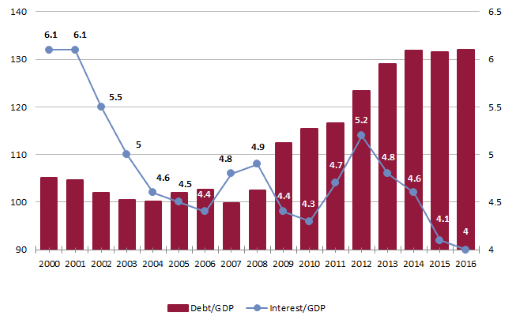 How much did the 2011-2012 crisis cost Italy in terms of greater interest on the public debt. Is Italy still paying for it? What effects would an increase in yields on government securities have on the debt? The Working Paper “The PBO analytical and forecasting model for interest expenditure” (in Italian) seeks to answer these questions using simulations and counterfactual analyses made possible by the development of a new analysis and forecasting tool that enables us to estimate the impact of the main factors that influence developments in interest expenditure (interest rates, composition of issues, borrowing requirement). The Working Paper describes the characteristics of the model and presents a number of scenarios, analysing the determinants of interest expenditure in the recent past and conducting a sensitivity analysis of future expenditure. The PBO website has an interactive dashboard (in Italian) offering a detailed view of the characteristics of government securities in circulation. Until the first decade of the 2000s, Italy benefitted from the decline in interest rates at the global level and the progressive convergence of spreads in Europe. Subsequently, in conjunction with the sovereign debt crisis, rates on Italian public debt reflected greater country risk. The intervention of the European Central Bank (ECB) and the adoption of Quantitative Easing (QE) caused interest rates to decline to an extent that interest expenditure as a percentage of GDP reached an all-time low. We can use the PBO model to quantify the effect of the increase in rates on interest expenditure during the crisis, distinguishing between an acute phase (July 2011 – September 2012) and that immediately preceding the start of QE. Overall, it is estimated that for the period 2011-2016, the crisis increased interest expenditure by about €47 billion, of which about €31 billion in the acute phase and €16 billion in the subsequent period. In 2016, the legacy of the crisis still amounted to about €7.6 billion overall. The PBO model also makes it possible to estimate the impact of a hypothetical increase in the cost of borrowing on interest expenditure in future years. To quantify the effects of a permanent increase in rates on government securities beginning in 2018 and continuing over the entire forecasting horizon of the EFD, two alternative shocks to the yield curve were simulated. In the first case, the sensitivity of interest expenditure is assessed by simulating a 100 basis point shock across the entire yield curve (as from January 2018 and over the entire EFD forecasting period, i.e. until 2020). As the table shows, interest expenditure would increase by about €1.8 billion in the first year (+3.4 per cent of expenditure), €4.5 billion in the second (+8.6 per cent) and €6.6 billion in 2020 (+12.6 per cent). The resulting increase in the borrowing requirement would be equal to 0.1, 0.3 and 0.4 points of GDP, respectively. The simulation was repeated by considering the impact of a differentiated shock across the yield curve, applying a spread to the yield curve that was similar to the change in the cost of issuing securities during the sovereign debt crisis. 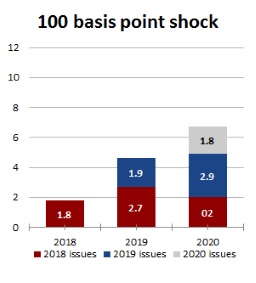 The increase in interest expenditure would be markedly larger than that found in the previous exercise, contributing to an increase in borrowing that would amount to €11 billion in 2020 (0.2, 0.4 and 0.6 points of GDP, respectively). 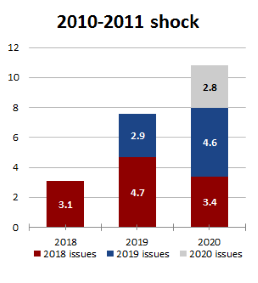 In any case, the duration of the exposure to the shock is important: if this is prolonged, as during the sovereign debt crisis, it is more likely to cause substantial increases in interest expenditure that would affect the path of convergence towards the objectives established in the European Stability Pact.